Preheat oven to 350. To make the cake: Combine all of the ingredients and mix well. Pat batter into a lightly greased 13×9-inch baking pan with hands into an even layer. Prepare filling. To make the filling: In a large bowl, beat the cream cheese and pumpkin until smooth. Add the eggs, vanilla, and butter, and beat together. Next, add the powdered sugar, cinnamon, nutmeg, and mix well. Spread pumpkin mixture over cake batter and bake for 40 to 50 minutes. Make sure not to over bake as the center should be a little gooey. Serve with fresh whipped cream or cinnamon-flavored ice cream. 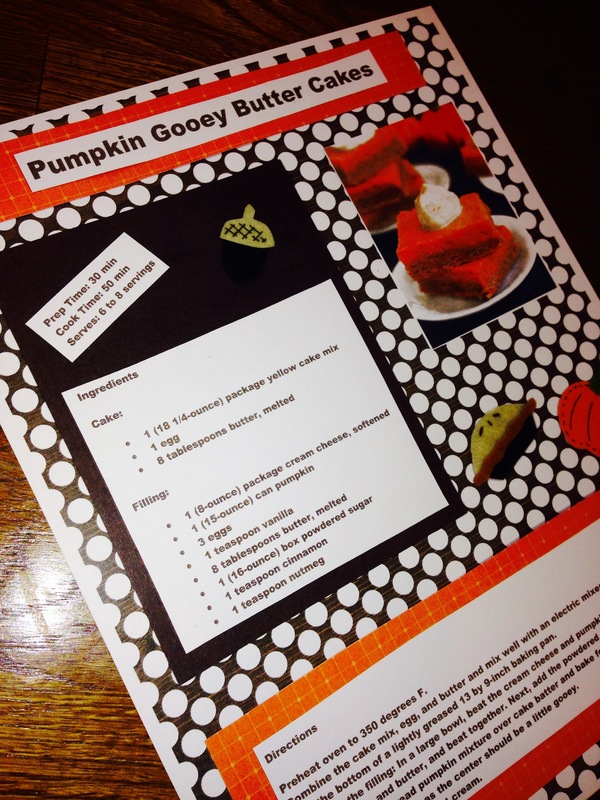 Here is the scrapbook page I designed for this recipe. Read here to learn about our Family Cookbook Scrapbook. Hope you enjoy this recipe. Thanks for reading.